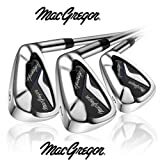 MacGregor Heritage Golf Irons are perfect the perfect match for a beginner/improving player. This entry was posted in Golf and tagged 2016, Golf, Griphite, Hand, Heritage, irons., MACGREGOR, Mens, Package, Right by FPSports. Bookmark the permalink.